In the midst of an enormous amount of discussion from politicians, military leaders and academics about what to do about Iraq, the average American has been accused more than once of shutting down on the subject. Everyone is tired of this war, it seems, on all sides, and yet it relentlessly goes on because enough people have a stake in being the winners. It takes a couple of speeches and a single vote to start chaos, but countless discussions, studies, and plans to begin to end it. It’s so much easier to not read those sections of the newspaper. I read David Griffith’s A Good War is Hard to Find because I wanted to understand how cheap yellow ribbon stickers (a symbol I remember being for the Iran Hostages) came to mean patriotism and how thoughtful dissent from academics sparked cries of high treason. What intrigued me is that Griffith does not profess to be anything other than who he is: a writer and teacher who was outraged by the Abu Ghraib photographs and wondered how on earth such a horrible abuse of human rights could have occurred. He quotes from a broad range of pop and literary cultural references in the essays within his book -- everyone from Susan Sontag, Hunter S. Thompson, Quentin Tarantino, Captain Kirk and the poor bastards from Deliverance are here -- as he ruminates on all things American and violent. Mostly Griffith is curious about why violence seems to be so accepted in American culture, and where the cues may be that predicted the sort of casual attitude towards violence and humiliation evident at Abu Ghraib. He begins A Good War with an essay about studying the Dresden bombing when he was in high school, an event he considered in sharp contrast to the First Gulf War, which was happening in real time. “Dresden was different, I told myself. Dresden was butchery, barbarity. The bombing of Iraq, as I saw on television every night for a few months, was clean, efficient, just.” That was how he felt, then. The rest of the book is a series of essays that focus on Griffith’s exploration of what should have changed, both for him and the rest of country, after Abu Ghraib. But as much as “Prime Directive” is about what Graner, England and the others did in Iraq, it is also about what Griffith did, initially as a lark, at that Halloween party. Looking on from the outside and shaking our heads in disbelief is an old American tradition, and Graner and the others are merely continuing our history of recorded atrocity, simply living up the culture of horror that we move from postcards to movie screens with an ease that is truly grotesque, and a historical amnesia that shames us all. “Jamil Abdul Husain grieves for his brother, Haydar Abdul Husain, 25, who was killed when a suicide car bomb exploded in a small market in Tikrit on May 11, 2005”. David Griffith would say this book is too real for the American people; it demands too much from those who would much rather give little attention to this war and its complicated classes of victims. Pity the dead child, but you wonder, too, why his family didn’t stop that car, why they were on that road, what they were driving at all. You shake your head, you turn the page; you rationalize even this death. I think maybe I have reached a personal tipping point in this war because of that little boy. 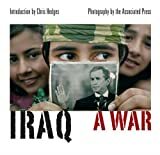 In his introduction to Iraq: A War, Hedges writes, “The experience of war overpowers the alienation many left behind. They become accustomed to killing, carrying out acts of slaughter with no more forethought than they take to relieve themselves. And the abuses committed against the helpless prisoners in Abu Ghraib or Guantanamo are not aberrations, but the true face of war. In wartime all human beings become objects, objects either to gratify or destroy or both. And almost no one is immune. The contagion of the crowd sees to that.” And that is how little Mohammed Saleem ends up a casualty. We shot first, they shot first, we were wrong, they were wrong. Who really gives a damn when they see him lying in that box? But too late for Mohammed Saleem, too late for more than 3,000 dead American soldiers, too late even for Lynndie England and Sabrina Harman. A slim volume of essays, another 150 pages of photographs; is it too much to ask that we walk away from the inanity of our own lives for the time it takes to consider the big picture they each present? Griffith and Hedges and the AP photographers have done all the hard work; it’s just left to us to give their work an hour or two out of our day. And quite frankly, I think it is long past due that we give this war our time.